Plate was hand cut out of plain sheet brass, iron hooks soldered, construction is simple and could be done by almost any blacksmith or small metal working shop. Size of the buckle and thickness of the sheet varies considerably. Ref: Mullinax Expanded Edition, Plates 184 to 186. P0362...Rectangle belt plate, plain sheet brass, likely Confederate wartime manufacture. Plate was hand cut out of plain sheet brass, iron hooks soldered, construction is simple and could be done by almost any blacksmith or small metal working shop. Size of the buckle and thickness of the sheet varies considerably. Plate measures 44mm X 65mm. Dug plate, hooks missing. Recovered: Third Battle of Winchester, by Harry Ridgeway in the 1960's. 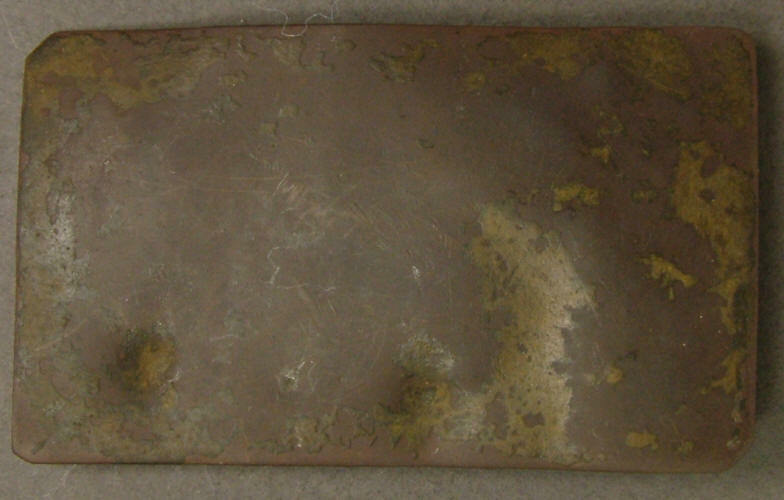 P0284...Rectangle belt plate, plain sheet brass, likely Confederate wartime manufacture. Plate was hand cut out of plain sheet brass, iron hooks soldered, construction is simple and could be done by almost any blacksmith or small metal working shop. Size of the buckle and thickness of the sheet varies considerably. Plate measures 46mm X 72mm. Dug plate, hooks missing. Recovered: Shenandoah Valley, Virginia by Steve Baker. P0285...Rectangle belt plate, plain sheet brass, likely Confederate wartime manufacture. Plate was hand cut out of plain sheet brass, iron hooks soldered, construction is simple and could be done by almost any blacksmith or small metal working shop. Size of the buckle and thickness of the sheet varies considerably. Plate measures 51mm X 75mm. Dug plate, hooks missing. Recovered: Shenandoah Valley, Virginia by Steve Baker. P1224...Rectangle belt plate, plain sheet brass, likely Confederate wartime manufacture. Plate was hand cut out of plain sheet brass, iron hooks soldered, construction is simple and could be done by almost any blacksmith or small metal working shop. Size of the buckle and thickness of the sheet varies considerably. Plate measures 44mm X 70mm. Dug plate, iron hooks are partial. Recovered: Port Hudson, Louisiana, by Emile Mancuso. P1264...Rectangle belt plate, plain sheet brass, likely Confederate wartime manufacture. Plate was hand cut out of plain sheet brass, iron hooks soldered, construction is simple and could be done by almost any blacksmith or small metal working shop. Size of the buckle and thickness of the sheet varies considerably. Plate measures 56mm X 86mm. Dug plate, iron hooks are missing. Recovered: Fredericksburg, Virginia. P1396...Rectangle belt plate, plain sheet brass, likely Confederate wartime manufacture. Plate was hand cut out of plain sheet brass, iron hooks soldered, construction is simple and could be done by almost any blacksmith or small metal working shop. Size of the buckle and thickness of the sheet varies considerably. Plate measures 45mm X 75mm. 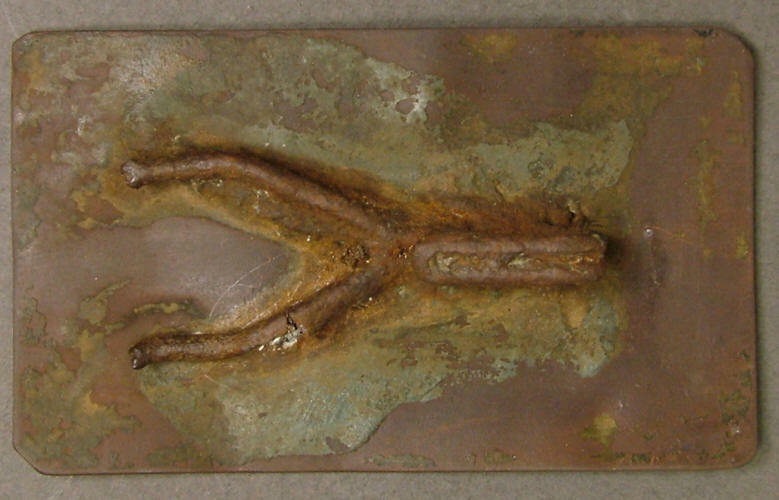 Dug buckle, iron hooks are partial. Recovered: South Mountain Maryland. P1921...Rectangle belt plate, plain sheet brass, likely Confederate wartime manufacture. Plate was hand cut out of plain sheet brass, iron hooks soldered, construction is simple and could be done by almost any blacksmith or small metal working shop. Size of the buckle and thickness of the sheet varies considerably. Plate measures 44mm x 70mm. Dug plate, hooks missing solder marks are strong, face has been brushed. Recovered: Virginia campaign. P1922...Rectangle belt plate, plain sheet brass, likely Confederate wartime manufacture. Plate was hand cut out of plain sheet brass, iron hooks soldered, construction is simple and could be done by almost any blacksmith or small metal working shop. Size of the buckle and thickness of the sheet varies considerably. Plate measures 52mm x 76mm. Dug plate fragments of iron hook remain. Recovered: Virginia campaign.